The carpal tunnel is a narrow passageway found on the anterior portion of the wrist. It serves as the entrance to the palm for several tendons and the median nerve. In this article, we will look at the borders and contents of the carpal tunnel and its clinical significance. The carpal tunnel is formed by two layers: a deep carpal arch and a superficial flexor retinaculum. 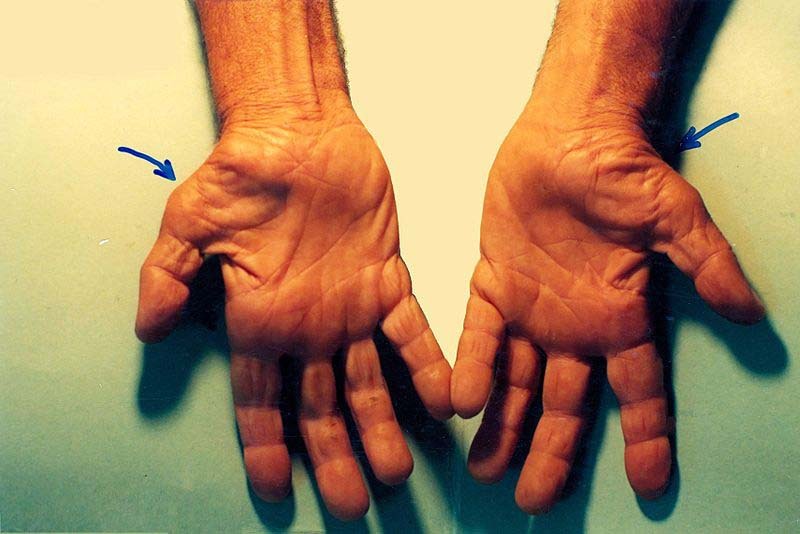 The deep carpal arch forms a concave surface, which is converted into a tunnel by the overlying flexor retinaculum. Concave on the palmar side, forming the base and sides of the carpal tunnel. Thick connective tissue which forms the roof of the carpal tunnel. Turns the carpal arch into the carpal tunnel by bridging the space between the medial and lateral parts of the arch. Originates on the lateral side and inserts on the medial side of the carpal arch. To find where the carpal tunnel begins on yourself, locate your distal wrist crease, which aligns with the entrance of the carpal tunnel. Fig 1 – Transverse section of the carpal tunnel. The carpal tunnel contains a total of 9 tendons, surrounded by synovial sheaths, and the median nerve. The palmar cutaneous branch of the median nerve is given off prior to the carpal tunnel, travelling superficially to the flexor retinaculum. The 8 tendons of the flexor digitorum profundus and flexor digitorum superficialis are surrounded by a single synovial sheath. The tendon of flexor pollicis longus is surrounded by its own synovial sheath. These sheaths allow free movement of the tendons. 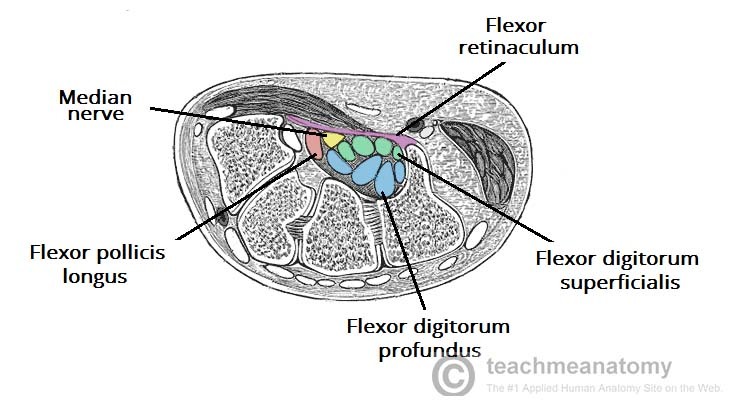 Sometimes you may hear that the carpal tunnel contains another tendon, the flexor carpi radialis tendon, but this is located within the flexor retinaculum and not within the carpal tunnel itself! 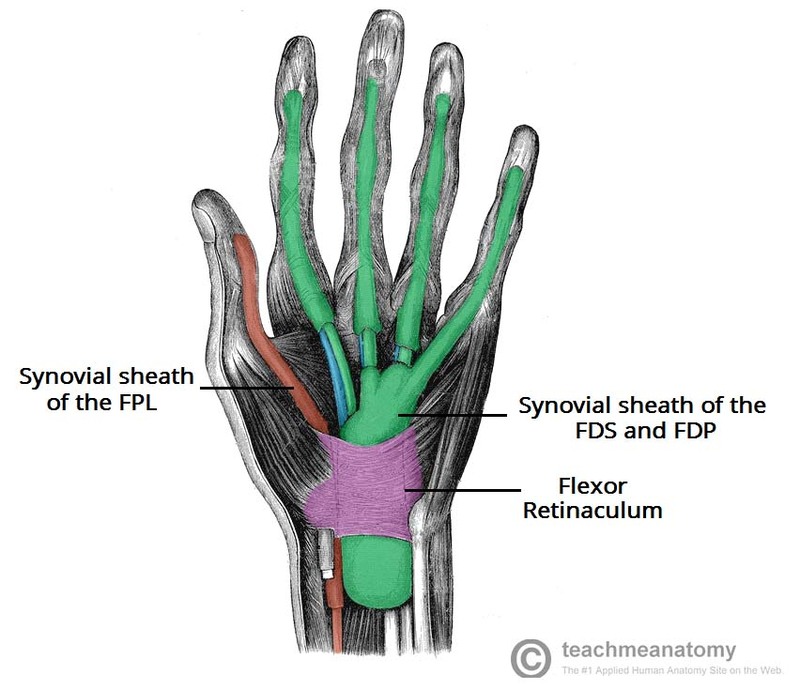 Once it passes through the carpal tunnel, the median nerve divides into 2 branches: the recurrent branch and palmar digital nerves. The palmar digital nerves give sensory innervation to the palmar skin and dorsal nail beds of the lateral three and a half digits. 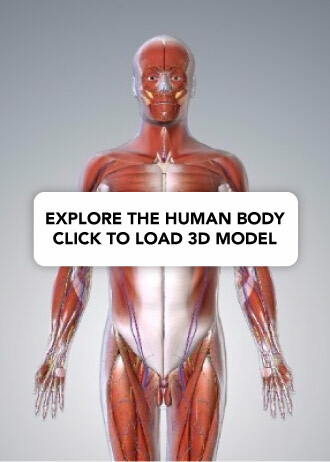 They also provide motor innervation to the lateral two lumbricals. The recurrent branch supplies the thenar muscle group. 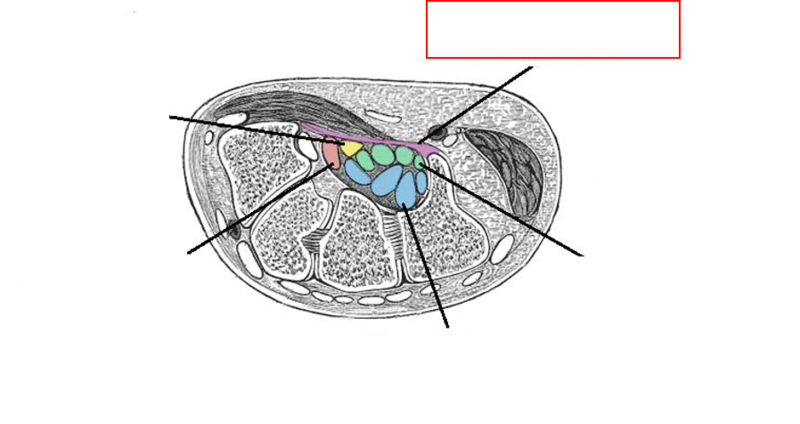 For a more detailed look at the median nerve, take a look here. Compression of the median nerve within the carpal tunnel can cause carpal tunnel syndrome (CTS). It is the most common mononeuropathy and can be caused by thickened ligaments and tendon sheaths. Its aetiology is, however, most often idiopathic. If left untreated, CTS can cause weakness and atrophy of the thenar muscles. Clinical features include numbness, tingling and pain in the distribution of the median nerve. The pain will usually radiate to the forearm. Symptoms are often associated with waking the patient from their sleep and being worse in the mornings. Treatment involves the use of a splint, holding the wrist in dorsiflexion overnight to relieve symptoms. If this is unsuccessful, corticosteroid injections into the carpal tunnel can be used. In severe case, surgical decompression of the carpal tunnel may be required. Fig 3 – Thenar muscle wasting, secondary to carpal tunnel syndrome. What forms the roof of the carpal tunnel? Which of the following tendons passes through the carpal tunnel? Which nerve passes through the carpal tunnel?